Hey... here's something that every German Shepherd dog owner should know. I call these the rule of thumb that you should follow to ensure that your dog know his position in the family - the human pack. If your GSD gets aggressive when you touch his food or growls at anyone in the family, these rules should be followed strictly. Remember, our dogs are the most lovable member of the family, but they should have a clear rank in the pack and they should know that perfectly. Dogs - especially the dogs like German Shepherds, Rottweillers, Dobermann Pinschers etc. that lack in this clear order are the most unhappy member of the pack and might even become nightmare for you. You need to understand your German Shepherd Dogs and it can be done by seeing the way way he carries himself! Sometimes, your German Shepherd Dog might not be showing signs of aggression, however the dog might suddenly start showing signs of separation anxiety, such as destructive behaviors when you get out of your house. If your German Shepherd Dog steals food from your hand or from your friend's, this gives an indication that your dog has no respect for the human, and doesn't see them as the leader of the pack. Unquestionably, your GSD shouldn't be the alpha member of the household pack. Such dogs (irrespective of breeds), who questions his place in the household pack are sure to become destructive, because he is confused and tend to take his anxiety out on you or whoever comes in his way. Just on the contrary, if your GSD knows his place in the household pack is a happy companion and would never exhibit undesirable behavior. If you are a responsible GSD owner you should follow the rules mentioned below to ensure that your German Shepherd Dog knows his place in your human pack. Teach your GSD to Heel: One most effective way to make him understand that you are the Alpha member of your pack is to take him for a walk... not the type of walk that you mostly come across. Make him heel not to lead you, but to be led! Don't allow him to pull you and to sniff or eliminate where ever he wants, but where you allow. Sometimes trainers will prefer your dog to pull hard. Don't allow this until he is for show. Feeding: Eat before feeding your dogs. If you have to feed your Shepherd before you, you can do so, but do not forget to keep him away from you when you eat. Do not allow any member of your family to feed your dog any table scraps during your meal time. Feedings must be at a scheduled time. Rushing through doorways: Do not let your GSD go through any doorways first. Or up or down the stairs first. Your Shepherd must always go through the doorways or up and down the stairs following you or other human member of your pack. Act of Ignorance: If you were away for a long span of time your dog will be anxious to see you back. This is the power of love. But still when come back in the room, ignore your beloved boy for a minute or two. Obedience Command: Simple obedience commands such as “Sit” and "Stay" must be taught well. Commands should be given to obey before any pleasurable interaction with your German Shepherd Dog. Before all play sessions, feeding, walking, petting your German Shepherd Dog should be know to be quite. Your dog should take the treat from your hands gently. Higher Pack Position: During the time you are establishing your higher pack position (Alpha Membership), don't hug your dog, nor pat your dog. Eye Contact: Make sure your dog should avert his gaze first when you establish an eye-to-eye contact with him. If you avert your eye contact first this reinforces the dogs higher power position. Do not allow your kids to participate in the staring contest with your dog. If your children avert or blink first, it will make your dog think "He" is the Boss. Fetching Games: Games of fetch, pull or play with toys should be started anf ended by you and not your dog. No tug-of-war: Tug of war is the game of power. In case you lose the war, it may reinforce your German Shepherd to come to the conclusion that he is more powerful than you and if this happens consistently, your dog may develop a dominating tendency. Teach him "Release Command": It is mandatory to teach your German Shephersd Dog to release things. Just teach him the one word command - "DROP" to release things. Any objects your dog has in his possession should be able to be taken away safely by you and othet members of your family. Don't Leave Your Kid and Dog Unsupervised: Kids should never be left unsupervised with dogs. This doesn't hold good only for your children but for anyone who cannot maintain leadership over your dog, especially if he is a dominating dog. Don't be scares and Avoid anxiety: There's actually no reason to fear your dog, but fear sometimes come if your dog has a highly dominating nature. When you are around your dominating dog avoid emotions like fear and anxiety... also do not be harsh and rude to him. German Shepherds Dogs are highly sensitive and can sense these emotions more effectively than many other dog breeds. If he senses these emotions he might consider you as a weaker member of the pack, which will escalate your problem. Physical and Mental Exercise: Most of the people tend to confuse happiness with excitement in your German Shepherd Dog. The most successful way to maintain your Alpha position in the pack is to humanize your dog's behavior, although it's not everyone's cup of tea. Putting him to training session is essentially important! If your German Shepherd Dog runs around insanely excited, then he is lacking in physical and mental exercise. Take him to regular exercise - play session. But make sure you should make him practice the "Sit" and "Stay" activities in the middle of the play. This way you can ascertain your leadership by giving him "Sit" and "Stay" command. These are the rules that are not confined with German Shepherd Dog breed, but most of the other powerful, stubborn and intelligent breeds of dogs. By incorporating behaviors your dog will consider you to be the leader of the pack - Alpha over him! Obedience exercises simply works like magic while maintaining your Alpha position. 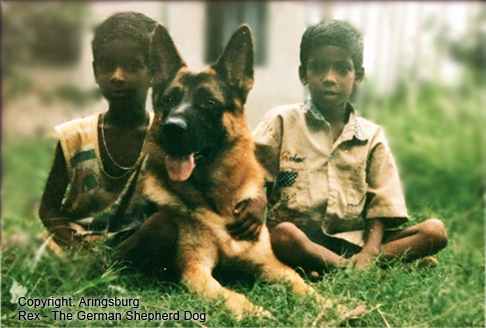 Click here to know how to deal with difficult dogs and also find some Frequently Asked Questions about German Shepherd Dogs! Really helpful advice. Must have taken you a long time to write but it was worth it. Some real gems in there.